I'm on a vacation in Edinburgh right now. I wasn't planning on seeing any theatre here, but of course, this is Robert Louis Stevenson's home town - my old friends Jekyll and Hyde were bound to find me, even if I didn’t go out of my way looking for them. 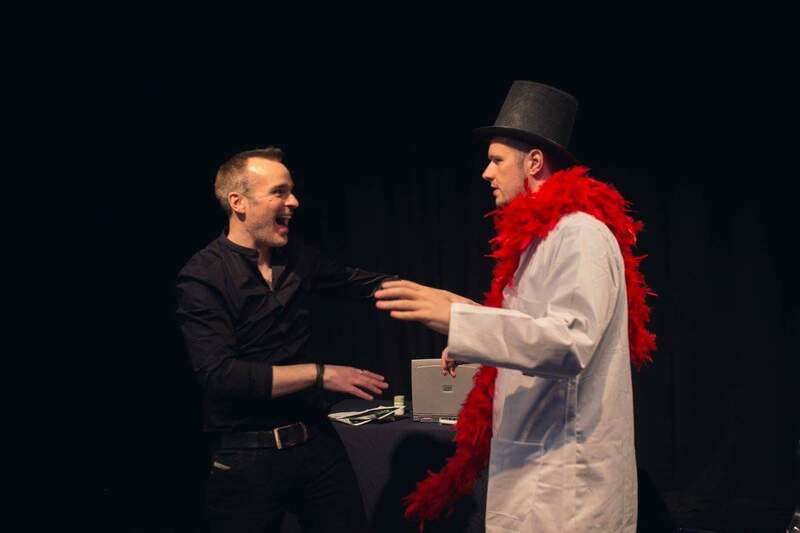 I stumbled across Rough Cut Robin Productions' play Jekyll and Hyde: A Specimen, playing in the Scottish Storytelling Centre. And am I glad I did! Hyde and Jekyll ready to have fun! Jekyll and Hyde: A Specimen is an one-act play written by Donald Smith. It features actors Robbie Gordon and Gavin Paul in all the roles: the former as Jekyll and McKey (a new character that combines Lanyon and Carew from Stevenson's novella), the latter as Hyde and Utterson. This play has different actors playing Jekyll and Hyde. When I heard of a musical adaptation with similar casting, I thought literally splitting the leading role in two is a bad idea - but no, at least here, it actually works very well. Hyde is the physical embodiment of the voice in Jekyll's head. He's been there all the time, but the drug Jekyll tests on himself amplifies him. To others, Hyde appears coarse and cruel, but towards Jekyll, he's all nice and cheerful, almost bubbly: let's party, let's go and have fun! When Hyde takes the wheel, a good time is had by the both of them, so Jekyll becomes addicted to listening to Hyde fast. I saw the show only once (could've gone for seconds right away, but the performance I saw was the last one of the run) and holding back a coughing fit messed with my concentration a little (damn this cold), so some details are lost on me already. But as a whole, the story is very faithful to Stevenson's original story... unlike, say, certain musical adaptations. It was very nice seeing an adaptation like this live. Like the book, the play is short, meaning there is no need to stuff it with romantic sideplots or other superfluous action. Like the book, it's also no black-and-white good/evil thing but a bit more complicated than that. It deals with exploring selfish desires, acting upon them and letting an addiction consume you. The actors do very convincing job jumping from one role to another - never thought I'd see the same person play Hyde and Utterson in the same performance! I especially liked Jekyll and Hyde's scenes together, how they made Hyde's influence on Jekyll and Jekyll's addiction to acting upon Hyde's whims very tangible. So thank you, gods of theatre, for guiding my path past the Scottish Storytelling Centre and allowing me to see the poster in the window. Happy upcoming 2018 to all! Photo from Rough Cut Robin Productions' Facebook page.